He who is pure of soul and chaste in life always speaks the words of the Spirit discreetly, and in accord with his own measure he speaks of the things of God and of the things that are within him. But when a man’s heart is crushed by the passions, his tongue is moved by them; and even though he speak of spiritual matters, yet he discourses passionately, to the end that he might be victorious…. One of the mistakes I have often made in speaking of spiritual things is to speak about them in a worldly way. St. Isaac points out that how one speaks of spiritual things is perhaps more important than the spiritual matters themselves. St. Isaac gives us some guidance to help us discern our actual inner state when we speak of spiritual things. He is not providing us with a prescription for how we should speak. Rather he his providing a diagnostic tool to help us understand when we are speaking of spiritual matters inappropriately, or according to our passions. As a person interested in developing a deeper relationship with God and as one conversant in “spiritual matters”—especially as a priest who is almost constantly speaking about spiritual matters—I am concerned that it is all too easy for me to deceive myself into thinking that I am indeed living by and experiencing in my own inner life the spiritual realities and principles that I talk about, when in reality I am, as St. Isaac says, “crushed by the passions”. St. Isaac in the quote above seems to be offering us two pointers to help us discern our inner state. The first has to do with speaking discreetly, which I will talk about in a moment; and the second has to do with speaking of things that our within ourselves. This is a point made often by St. Isaac and many other spiritual writers: When we speak of spiritual things, we need to limit ourselves to what we ourselves actually experience. It is very tempting to give advice on spiritual matters about experiences, states, conditions and disciplines that I myself have not actually experienced and do not actually practice. I’ve read a lot. I have read about holy men and women who have experienced great heights in their relationship with God, men and women who have shone with the Uncreated Light, who have been caught up in prayer, seen visions; who have fasted, prayed and kept vigil with great perseverance; who have born the fruit of a God-filled life. But I have personally experienced very, very little of this. My experience has been basically a continual trying and failing, a never-ending exercise in falling and getting back up again. I have come to realize that I am a one-talent Christian, doing my best just to keep my one talent in the bank (the Church) where at least it will earn interest (rather than buried in self-pity, by pulling away and not even trying, again and again). I appreciate—more than appreciate—I am amazed by those who have been given two or even five talents of Grace, who have taken the Grace given to them and “traded” with it, who have earned five talents more through their diligent application and attention to the Grace given them. These Holy Ones amaze me. They inspire me. But when it comes to my giving advice to others, I need to speak “in accord with my own measure.” Yes, I can and should speak of what the Saints have achieved, the advice they give based on their actual experience with God. But I must be very careful not to speak in such a way that might give the impression that I personally know and live and experience what I am talking about. The passions are tricky things. It is especially difficult to notice that we are speaking passionately about spiritual things when others are asking us for advice. We must be very careful. I must be very careful. 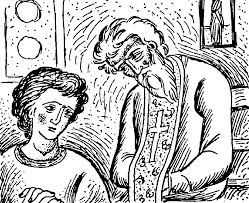 According to St. Isaac, one way to know that we are speaking passionately about spiritual matters is to notice if we are speaking in accord with our own measure, of things that are actually in ourselves. Truly, I think we deceive ourselves when we speak beyond ourselves about spiritual things. We deceive ourselves because we think speaking of spiritual matters is just like speaking of airplanes or philosophical principles. The spiritual life does not work that way. When we speak of spiritual things, we communicate much more by who we are than by what we say. And if these two do not line up relatively well, those to whom we speak will know. The effect of our words will not be life-giving, but will rather be just more information, and that’s in the best case scenario. In the worst case scenario, our passionate words on spiritual matters will communicate not life but death, not help but condemnation, and not encouragement but guilt. When speaking on spiritual matters, less is generally more. So, one of the ways St. Isaac give us to discern our spiritual state when speaking about spiritual matters has to do with staying within the limits of ourselves: our own actual experience of the spiritual life. When we find ourselves speaking or tempted to speak beyond ourselves in spiritual matters, then we know it is time to shut up. We are speaking passionately, and even if the words we speak are true on some level, to speak them with passions is to betray the very words we speak. careful and circumspect in one’s speech or actions, especially in order to avoid causing offense or to gain an advantage: we made some discreet inquiries. intentionally unobtrusive: a discreet cough. My first serious spiritual conversation with a holy person was with an abbess. More than any particular thing she said at that time, what has stayed with me over the years has been how she spoke. She was not only tentative in what she said (This might be, Have you considered this, You could try to…), she was very quick to back down and admit that she might not at all know what the best or right thing to do in this situation was. As soon as I challenged something she said, she would respond, “Perhaps you are right.” In order to get anything out of her I had to shut up and just humbly listen. Mother Abbess was very discreet. St. Isaac tells us that a passionate person, one “crushed by the passions,” speaks of spiritual things “to the end that he might be victorious.” It seems to me to be a pretty sure sign that I am speaking passionately about spiritual things when I find myself angling to be right, trying to prove my point, or showing how the other person is wrong. When I am not speaking discreetly about spiritual things but am intruding where I am not invited, causing offence or gaining advantage, when I am intent on showing that my position, idea, advice or observation is right, then (if I notice it in time) I know it is time for me to stop talking. Spiritual advice must be given and received in a spiritual, holy, manner. We are not talking about worldly matters, so we cannot speak in a worldly way. It just doesn’t work. You end up communicating many things you never intended to communicate and little of what you intended to communicate. Here I am speaking from personal experience. It seems as though it is always best to say nothing at all. “Silence,” St. Isaac tells us, “is the language of heaven.” And yet, love compels us to speak. With all of the dangers and possibilities for misunderstanding, still we feel we must speak because we love. And so we speak about spiritual things, we speak in words that which can only be rightly communicated in silence. We speak in words because in our fallen and broken and not-yet-healed state it is all we have to encourage and instruct, to help and to aid one another. But we speak carefully, discreetly, and about that which is within us, careful not to imply that we too experience the same spiritual heights as those holy Fathers and Mothers we read of. Because, in the end, I know that I cannot help anyone. God is the One who helps. “Salvation is of the Lord,” we are told repeatedly in the scriptures and hymns of the Church. I am merely a helper. We might even say an unnecessary helper in that God doesn’t need anyone’s help to save. And yet, God has made us necessary. God has invited us (each of us in our own little ways) to be helpers in bringing about the salvation of those around us, the salvation that He alone effects. And God brings us to this work of love even before we are perfected, even while we are still sinners and broken and screwing up every time we open our mouths, God uses even us as we are now. God has invited us to love with Him, to give what we have (not pretending that we have more), to share what has been giving us, even if what has been given us is much less than what has been given to others. It’s OK to be a one-talent Christian—even to be a one-talent priest. Like the widow who gave her two mites (all that she had to live on), so we too give in love to each other the little that we have. The power to save lies not in the size or effectiveness of the words or gifts or actions we give to one another, but the power to save lies in the One who has invited us into His labour of love. 1005Perhaps there should be a whole lot less blogging, especially by priests. Dear Fr. John, Isn't that the truth. May God have mercy on me on the day of judgement. My only defence will be that I thought I was being compelled by love, but perhaps I have been wrong. God will reveal everything hidden on that Day. The irony that I write about the dangers of speaking (or writing) about spiritual matters on a blog on spiritual life is not lost on me. Thank you for your response, Father. I am mainly thinking how easy it is for us all to pontificate (as I am now) on things we experientially know so little about. Having said that, I am never sorry or disappointed to read what you right.